The CARRYS Replacement Coil is designed for T4-R and T4-R Baby Tank. It's also compatible with TFV8 BABY Tank/NRG Tank/Eleaf ELLO. 1.5ohm and 0.6ohm coils for your choice. 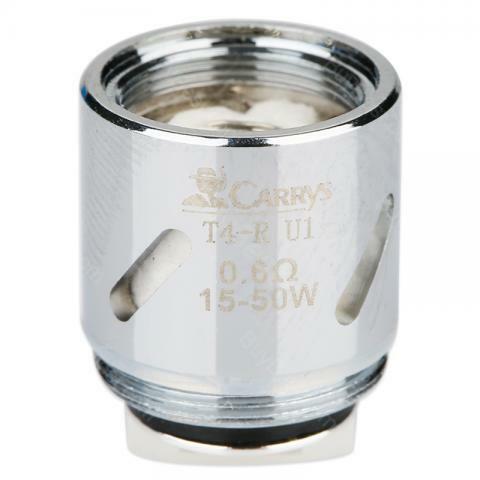 The CARRYS Replacement Coil is designed for Carrys T4-R and T4-R Baby Tank. It's also compatible with TFV8 BABY Tank/NRG Tank/Eleaf ELLO. 1.5ohm and 0.6ohm coils for your choice. 5pcs each pack. Get them as a spare part. • It's for T4-R/T4-R Baby. • It is also compatible with TFV8 BABY Tank/NRG Tank/Eleaf ELLO. If you haven’t tried an RBA in your Baby Beast tank, you’re missing out. The flavor is awesome, assuming you wick it properly. Plus the coils last waaaaaaay longer than the other replacement coils you would buy. The others lasted me roughly a week or two. So far I’ve been on the same coils for almost a month. Plus if you get a flavor you don’t like, it’s as simple as switching the cotton. Great product at a great price! CARRYS T4-R/T4-R Baby Atomizer Coils is a 5pcs/pack is designed for Carrys T4-R and T4-R Baby Tank. It's also compatible with TFV8 BABY Tank/NRG Tank/Eleaf ELLO. 1.5ohm and 0.6ohm coils.